This year marks the 50th anniversary of the Stonewall uprising and the beginning of the gay rights movement in America. It’s in remembrance of that event and its impact on our history that we invite you to join us for the 8th annual Cville Pride Festival! Can’t wait? We have events throughout the year, and special Stonewall celebrations, too. Join us! 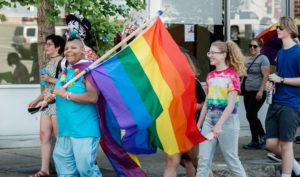 We’ll have events throughout Pride Week, culminating in the day-long festival on Saturday, Sept. 14. Stay tuned for details! 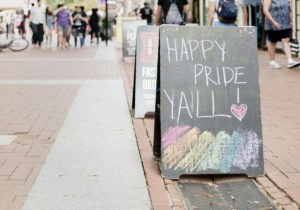 What is Pride in Charlottesville Like? 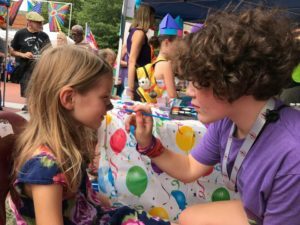 In 2018, our festival brought about 8,000 people to the downtown Sprint Pavilion to enjoy music, crafts, drag shows, children’s activities, food trucks, wine and beer and treats, rainbow merchandise, and dozens of vendors. The kid-friendly, joyful vibe of the event welcomes people from all walks of life. Getting involved is a great way to contribute to the LGBTQ community, meet friends, elevate your company’s visibility, generate new customers, have fun! This is YOUR festival! Without the engagement of the community’s energy, time, resources, goodwill, talent, skills, and collaboration, the festival would not happen.